Dash of Green: Eco-Film Festival! Whoops! Haven't blogged since Tuesday. Let's see, what did I do this week? Worked on a book script. Entertained visiting family again on Wednesday/Thursday. I have so many lovely photos of my time spent with Chita and company earlier this week, but I can't access them at this moment, and, besides, I want to dedicate today's blog post to a film I watched this very evening. 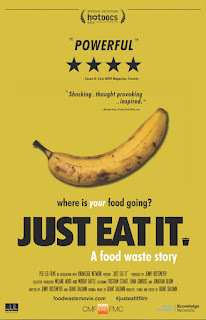 It was called "Just Eat It: A Food Waste Story" and it was presented by the 12th Annual Eco-Film Festival here in Corvallis. I must say it was an excellent documentary!! Even though we weren't able to watch to the very end of it, due to technical difficulties, I walked away from the film and subsequent panel feeling hugely inspired!! In what way, you ask? Why, to take up dumpster diving again! You may recall my escapades in the dumpster diving world a couple of years back, as covered in these posts, but I really didn't partake in it after a while...and I can't exactly remember why I stopped. But I swear the moment I walked out of the theater, I said to myself "I'm downtown already, so let's see what kinds of things I can score from the dumpster around here." Boom! Within two minutes, I'd unearthed perfectly good eggs from a bin behind the bakery. And when I got home, I donned my traditional DDing gear (black hoodie, reliable sneakers, durable jeans) and hit up the bin of a nearby grocery store that's never let me down. It was fun hanging over the edge of the dumpster again, with my hips acting as the fulcrum. Ha! I brought home some salsa, and four packages of tortilla/pita bread in varying degrees of organic/GF/natural/etc labeling. :D Also, I assume they all got tossed simply because they were near the "best by" date. I just know the quality is still good and that these foods are going to play a role in coming meals since we are such a tortilla-rice-and-beans kinda family! My dream is to locate grocery store dumpsters that have the kinds of abundance of items shown in the documentary (mind you, oftentimes food items are thrown out for mysterious reasons since they're not near expiration, nor expired, nor even damaged!) and give all the excess that we can't consume ourselves to folks/friends who are in need! Maybe even setting up a kind of fridge on the streets that we can fill with all the gratuitous thrown out items, like this man in Spain did that I read about over the summer. I must say, I'm so proud to live in a city like Corvallis that has an eco-film festival, because the upcoming movies look equally as compelling and enlightening. I hope you can find a screening of the film too, and see if it inspires you to rethink the value of food and all the energy that goes into it so that we can all try a little harder to avoid food waste. Also, I'll try to take photos of particularly impressive DD scores, or maybe just to show the variety. So until then, take care and Happy Eco-Film Festival! !